Woman’s World is a non-denominational overnight event that helps women understand their significance in God’s eyes. The program includes practical seminars, a dynamic keynote speaker, buffet meals, times of worship, and lots of other surprises. This year’s theme of “Everyday Heroes” will be a celebration of how the simple things we do everyday make a difference and how lifestyle evangelism benefits the Kingdom of God. It will be a fun and inspirational break from the winter months for all ages. Woman’s World has been a ministry of Manhattan Christian College since 1978. Amberly is passionate about the JOY found in Christ and wants to share that with Woman’s World! 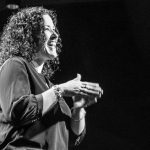 As a full-time speaker, author, radio personality, and humorist she has won the hearts (and funny bones) of people all over the country at hundreds of camps, seminars, retreats, chapels, and conventions. In addition to speaking, Amberly serves as an adjunct professor at Grand Canyon University. Amberly received her Master’s from Biola University in May of 1999. Since then, she has been featured in numerous devotionals by Starburst Publishers and penned Bible curriculum for both Gospel Light and Standard. She has written two devotional books: “Fragrance of Faith” and “Treasure of Trust” as well as being featured in “Remarkable Women of Faith”. Amberly has been married to her husband, Scott, since 1992. They have a daughter, Judah Catherine, and a son, Josiah Caleb. They reside in Arizona and love the Food Network. Prices include three keynote sessions, two buffet meals, five seminars, and keepsake surprises. All conference events are held at the Kansas State University Student Union located at 918 N. 17th Street, Manhattan, KS. Pick up your name tags and registration packets. Group together with your girlfriends and have your picture taken for a special keepsake. Scout out the location of seminar rooms. Get settled in your hotel room. When life is difficult rather than easy, complex rather than simple, potentially dangerous rather than safe, and exhausting rather than exhilarating, prayer is the secret weapon for every battle and situation. Prayer is the highway God uses to be involved in our lives. Come and be reminded of practical ways to use this hero’s weapon every day. You want to be an everyday hero to your family, but raising a strong family is hard work and you are not sure what to do to make a difference. Come and be encouraged. Discover some intuitive family strengths that if focused on, can provide breakthroughs in your family life. Often in our lives we have more demands and opportunities than time or energy. How do you decide when to seize and when to pass on what might be a good thing? This seminar will guide you in creating a personal mission statement and help you seek clarity on what God has called you to. Together, we will unpack how this statement can guide as you navigate through the opportunities in your life. Origin stories are critical starting points. Come explore the origin stories and trajectories of two well-known and beloved Old Testament women: Ruth and Esther. We may discover through these women in the Old Testament, that even through the ashes of difficult origin stories, everyday heroes and heroines arise. Potholes are those things that disrupt our life. Everyone has them, so how do we deal with them. The Bible is full of characters dealing with potholes and their examples give us suggestions on how to deal with our own. Bring your shovel and be ready to go to work. As Christian women, how do we live differently from the rest of the world? Do you want to live free from the persistent desires of the flesh? As children of God, we have all we need through the Holy Spirit to accomplish this. This Bible study will teach what God, through the Apostle Paul, wanted us to know about being free in Christ. Romans 12 along with other verses will be the guide to help us “to be different. Living in a social media driven world, we can sometimes create picture-perfect expectations for our lives. But how often do our homes, our diets, and our lives really fit into the mainstream ideal? And how often does this keep us from inviting others in? In this session, we discuss how to think out of the box to build relationships while juggling our own hesitations toward hospitality. Come and listen to the inspirational story of one woman’s atypical journey to motherhood—how she put her faith and trust in God through the struggles of infertility and adoption and how He filled her heart with the greatest joy imaginable. Explore how each of us as women exemplify the qualities described in Colossians 3:12. Learn about HEART (Helping Empty Arms Recover Together), a ministry aimed at helping those struggling with infertility/pregnancy loss/infant loss. Are you suffering with symptoms of anxiety, depression, fatigue, brain fog, or having difficulty focusing? Do you feel like you have exhausted all options to improving your symptoms? Gut health might be a significant player in improving your mental status. Come listen to how your gut health effects your brain function and discover some lab testing that will give us the clues we need to improve your mental health! One of the Bible’s most quoted verses is Habakkuk 2:4: “The just (righteous) shall live by faith.” As Christ-followers, we know and believe this truth, but how do we do it, how do we live by faith in a fallen world? Habakkuk discerns an answer to this question through a mysterious truth divinely revealed by our righteous God. Learn more about this fascinating book and its implications on faith in today’s modern world. The final marching orders of Jesus to the disciples was to go and make disciples of all nations, baptizing them and teaching them to obey all that He had commanded. We have those same marching orders. Discipling someone can be a very rewarding life-on-life ministry. Come hear practical ideas and tools you can use to invest in making disciples who in turn make more disciples for generations to come. Orphan Care: What Can I Do? God commands His people to care for orphans (James 1:27) but what does this mean for YOU? We will address tangible things that women of all ages (whether single, married, divorced, or widowed) and the church as a whole can do to be part of the solution for the orphan care crises in the U.S. and abroad. As a biological, adoptive, and foster Momma to six children, Heidi has a passion for talking about all things in orphan care ministry. Come and learn how to remove the doubt and confusion surrounding estate planning and charitable gift planning. Financial Planning Ministry has been helping individuals ensure their legacy for 35 years and they can help you, too. You can avoid losing dollars in probate costs and give yourself peace of mind in medical decisions, guardianship of children, and distribution of valuables. Services are FREE because FPM partners with Manhattan Christian College. As believers we have the privilege to come to God the Father as His adopted sons and daughters in Christ. That simple sentence should make us stand in awe as we grasp the true power in being fully, completely, unequivocally HIS! Come learn what it means to be adopted in Christ and how he can transform the way we live out the gospel through fostering and adoption. ourselves and our faith small. But fear and faith CANNOT co-exist. This session provides an inspirational and encouraging challenge to step outside fear and to fully embrace and understand what it means to be a child of God. What do you have in your change jar? What really counts? Where does the happy jingle in your heart come from? Is life revolving around earthly cents, common sense, or God’s wisdom? These questions will be the center of this open discussion and interaction about recognizing all of life’s blessings. You can be a hero to those on the mission field. Sending a monthly check to support your missionary is a great start, but only the beginning. This seminar will explore new ideas on how you and your church can care for missionaries and make them feel loved and connected. We will discuss how to practically care for missionaries whether they are on the field, home for furlough, or returning to the field. One of the greatest habits you can develop to become spiritually strong is scripture memorization. Do you need to change your attitude? Hope for a difficult situation? Peace in the midst of chaos? Learn the importance and benefits of memorizing scripture and how to add this spiritual discipline to your daily routine. This session is led by Awana representatives, a ministry that has been teaching children about God’s Word for over 60 years. Grieving is a process that is many times described in phases or stages, but in reality it is more like walking in a vast wilderness without a map or compass. Grieving is painful. Every loss is different and grief doesn’t look the same for everyone. We will discuss how to support those who are going through the entire emotional process of coping with a loss and trying to find their way in this unique wilderness. Call the hotel of your choice. • Guarantee the room with a credit card as requested. • Deadline for making a reservation is January 23, 2019..
• All rooms are quoted at a flat rate for up to four people in a room. • Rooms will be provided on a first-come, first-served basis as they are cleaned and made available. A free will offering, collected during the Saturday luncheon session is an integral part of the Woman’s World tradition. Since 1984, this offering has been awarded the following year as scholarships to deserving female students for their next academic year. These awards can only be used at Manhattan Christian College for educational purposes. Your contribution supports higher Christian education and directly impacts the future of the church as well as the future ministries of the leaders being trained at MCC. Thank you for your consideration. Resources Available: Audio tapes, CDs and DVDs of the three main sessions will be made available by Christian Audio Tapes of Bridgeport, IL. The 20 seminar sessions will also be recorded and can be purchased on audio tape or CD. Prices for these resources will range from $5 for MP3’s, to $6 for CDs, and $8 for DVDs. With the purchase of 6 items at the conference, you receive the 7th and 8th items FREE. What to Bring: Comfortable clothes, Bible, note pad, open heart, spirit of fun and laughter, and a desire to worship and grow in Christ. Special Services: Interpreters for the deaf will be available upon request prior to the conference. No provision has been made for child care at the conference.